Jeremy Frankel informs us that the British Newspaper Archive (BNA) has placed online the “Weekly Casualty List (War Office & AIr Ministry” for 1917-18. Some 2500 pages. This might be of interest to a number of readers here who had ancestors who fought in the war. Please note that BNA is a subscription service. 1914-1918 Prisoners of the First World War, Archives of the International Committee of the Red Cross is a searchable archive of prisoners who were American, Austro-Hungarian, Belgian, British (including the Commonwealth), Bulgarian, French, German, Greek, Italian, Portuguese, Romanian, Russian, Serbian and Turkish. Fighting Back, British Jewry's Military Contribution in the Second World War This book review may be of interest to those researching their ancestor's military service. Records are available from the MOD: Military Records of those who are deceased1. Records for deceased persons post 1919 are available but only with a letter of consent signed by the next of kin [as described by the MOD]. Charges are set by the Ministry of Defence for records post 1919. 1Records for people still living are available but only with a letter of consent signed by the individual concerned. Military records are largely at TNA in Kew, London. They go up to WW1 which are still being released as far as I know. For a search you need to know the regiment because they are organised by regiment. As far as I am aware TNA do not offer any research by post type facility. They do however offer a copying service once you know what it is you want and where it is stored according to their system. Medal cards and some other information is now available at Ancestry where a subscription is required to view the actual record pages. Discharges prior to 1850 are computerised and very easy to find. These are filmed and you can freely access the films at the TNA. 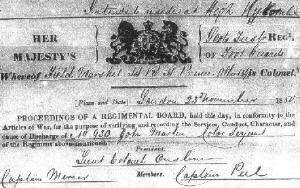 Other papers are in boxes by regiment then surname and there are several sets of papers in a box. For records post WW1 you need to contact the MOD who will make a non-refundable fee to search their 3 miles of records for you. You need permission from the person whose records you require or permission from their next of kin (the MOD decide who is next of kin). There are heavy penalties for trying to cheat them on this (I don't know how they know, but they do know, believe me!). Further details are available at The Veterans Website. Births, marriages and deaths of army personnel after 1837 are listed in an appendix to the GRO index. The appendices are not covered by FreeBMD yet. However, you can search them for a fee (subscription or PayAsYouGo) at Find My Past. War dead are listed at the website of the Commonwealth War Graves Commission. People who lost their lives as listed on this site, will also have a civil registration of death on the GRO appendix, as mentioned above. For any certificates in the appendix you must apply to ONS you cannot go to the local registrar. Once you have the references you can order from ONS on-line ordering. These are particularly useful because they give a man's regiment and army number, which will help you obtain his military records from The National Archives. Army personnel serving in the UK at the time of the censuses are recorded in the normal way. Check the censuses: 1841-1911 censuses. There are also CD-ROMs and books listing Jewish soldiers who died in the two world wars. AJEX-The Association of Jewish Ex-Servicemen and Women may hold information. Following complaints by members about this website, we no longer have a direct web link. Please be aware that certain members have experienced difficulties under data protection laws and have felt heavily pressured to donate to the association. AJEX have declined two requests for their comments on the matter. They appear to be disinterested in complaints and unconcerned that they have been accused of breaking data protection legislation. The webmaster would welcome comments from an AJEX representative so this matter can be cleared up. An alphabetical list of people we wish to honour. Further details of people in our Roll of Honour. Photos of cemeteries & gravestones from Australia and The Far East.